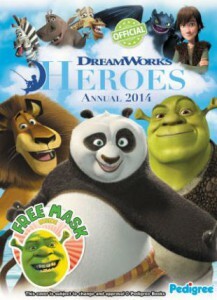 Dreamworks Animation have created a special tie-in compilation book called Dreamworks Heroes Annual 2014. In spite of that title, it’s already available in hardcover from Pedigree Books. “DreamWorks Animation has created some of the best loved animated feature films and TV shows of all time. They have released a total of 26 feature films, including Shrek, Madagascar, Kung Fu Panda, and How to Train Your Dragon, grossing nearly $11 billion worldwide. This Annual brings all your favorite DreamWorks characters together for the first time in this unique DreamWorks Heroes Annual 2014.” Check it out at Amazon. The advertisements are kind of hard to follow: Apparently this publication is also available as Dreamworks All-Stars Annual 2014, with a different cover.